I've been making these potatoes as long as I can remember. Long before than I moved to the US. Home, I just called them potatoes. 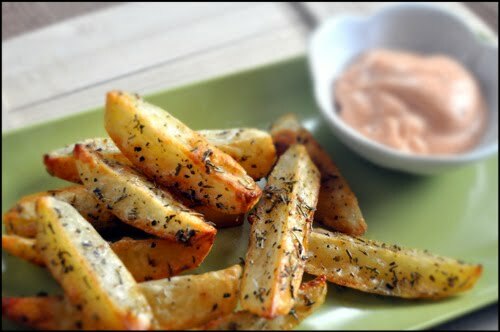 Here, my hubby explained to me, they were called 'steak fries'. Okie dokie. Regardless, they are one of the best potatoes ever, and I love potatoes. A good potato has to have three things for me. Yes, I'm joking. But for me, crunchiness or crispiness, is the single most important part in a good potato. Unless we are talking about casseroles, mashed potatoes and such dishes. So number one is still that crunch! Number two, it HAS to have enough grease, oiliness, however you want to put it. Yeah, I try to eat healthier and make plenty of average baked steak fries on a teaspoon of oil and such, but it is just not the same as a good greasy crunchy potato. So number two is fat. That sounds so awful, but hey, it is what it is. Try making a good duck confit without the fat. I dare you. Third one. SALT. There is nothing more sad than bland potato. I can live without the herbs even though they make it so much fun, but salt/season that potato please! Those three, and I guarantee you a good potato meal. My favorite way to eat this is actually not with steak, even though they are called steak fries. I love to eat this with the most simple bowl of green lettuce with aceto balsamico vinaigrette. Heaven. And perfect for warmer days ahead of us. Even though as I am writing this, I'm waiting for the rain to start and for temperature to drop, we have a storm system coming in. So much for the warm weather and sun in the next few days... Maybe I should make these again just to make myself feel better. Yes. This is 'anytime feel better' meal, especially because it couldn't get any simpler so you can literally put it together in 5 minutes and then just throw it in the oven! Mix it all up and enjoy with fries, on burgers or in any type of sandwich. I, on the other hand, prefer to eat it with garlic aioli. Put minced garlic on the cutting board and sprinkle salt over it. With the flat of the knife press the salt and garlic moving the knife back and forth in order to achieve a paste consistency. Whisk with all the other ingredients in a small bow and then let sit for a few minutes. Refrigerate if not using right away. So simple, yet delicious :) Great photos. Ohhhh! yummy! Looks like a great savory treat. Yes! But make plenty because by the time I took the photos of these fries, my hubby and son ate all the rest. They were rushing me to finish so they can eat the ones from the photos too. True story :) I got only two!!! 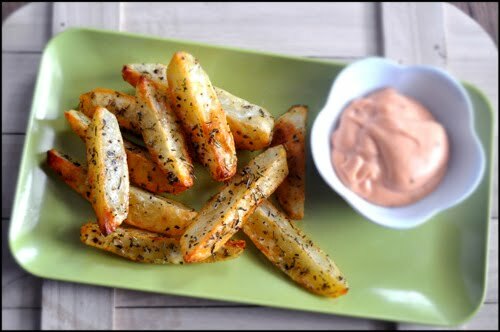 Loved these fries with the aioli sauce! I seasoned mine with S&P, garlic and rosemary. Blogging them soon. I love how simple they are too and the time it gives me to prepare everything else! Mogwai is a nickname we gave my son when he was a tiny baby (the whole gremlin thing :D), it didn't stick but it was inspiration for the blog name, thank you, I love it too! 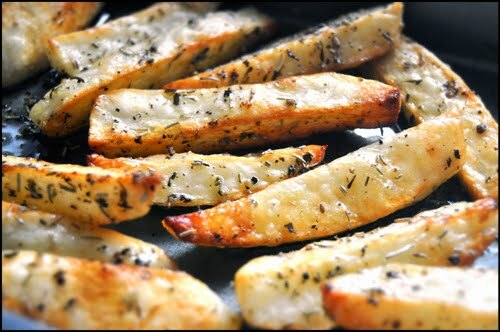 These fries should also go great with smetana (Russian sour cream). Love it so well!